• end with the meaning, "and then you can kill the baby." Don't Prune the Abortion Weed: "Child killing regulations just prune the abortion weed, and strengthen its root," says Jason Troyer of Colorado RTL. So like pruning your favorite bush to make it grow strong, if you want to make abortion a permanent part of society, then regulate the procedure and it will look more reasonable and humane. Child killing regulations backfire in the worst of ways. If Roe v. Wade is ever merely overturned, such regulations, including for example the Informed Consent laws unwisely promoted by Americans United for Life (AUL), will keep abortion legal, perhaps long enough to kill millions. Notre Dame Law School's professor emeritus Dr. Charles Rice stated on Mark Crutcher's Life Talk TV program that, "the pro-life movement... made a tragic error... in 1980 and '81 toward seeking a states' rights solution, actually promoting exceptions, and so on. What they're then saying is that an innocent human being can be legally executed, whenever a legislature so desires... and that makes that innocent human being a non-person." Denver attorney John Archibold, founding board member of three organizations, National RTL, AUL, and of the nation's first-ever right-to-life group, Colorado Right To Life, says that Dr. Rice's statement above is, "absolutely correct. And because these two venerable organizations, National Right To Life and Americans United for Life, on whose boards I served, because they adopted this so-called incremental strategy, which is not only immoral, but strategically wrong, I resigned from both of them." See Dr. Rice and John Archibold in the award-winning documentary Focus on the Strategy II. "oppos[ing] legislation that restricts abortion in any way... is making the legal right to abortion more vulnerable"
"We must end the fiction that an abortion at 26 weeks is no different from one at six weeks." "The fetus is more visible than ever before, and the abortion-rights movement needs to accept its existence and its value." "These are not compromises or mere strategic concessions, they are a necessary evolution." 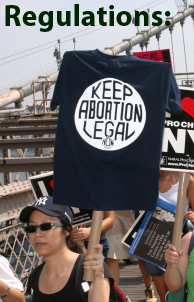 "We need to firmly and clearly reject post-viability abortions except in extreme cases." "Those kinds of regulations are not anti-woman or unduly invasive." We should "emulate the European system, which has some regulations"
"We should also work to sensibly regulate abortion facilities." "If we don't suggest sensible... regulation of abortion, we will be left with... no choices at all." Hear Reagan Ally Bob Dornan: In sixty seconds former congressman Dornan powerfully endorses this must-see video. This pro-life hero said it best: "I'm indebted to you American Right To Life. I got your documentary, Focus on the Strategy II. You gave me seven simple words, and I will never look at another piece of pro-life legislation without saying those words. It's a bad law if it concludes, 'and then you can kill the baby.'" Thirteen Swedish Journalists: Thirteen Swedish reporters traveled to Denver, Colorado and interviewed American Right To Life spokesman Bob Enyart. Though they were professional journalists, they could not keep from making their own pro-abortion argument: "America would not have so much opposition to abortion if the procedure were more humane and regulated as it is in Europe." The NAF's Kissling makes the exact same argument. American RTL had invited a couple of our nation's leading pro-life activists to attend the event with the Swedes. That experience helped to galvanize them to oppose abortion regulations as immoral and working to preserve abortion. Today, these advocate only for the right to life and personhood of the unborn child. Flawed Heritage Foundation Analysis: See ARTL's Heritage Foundation Analysis Flawed that demonstrates the severe errors in their often-cited report by Dr. Michael New. For example, Colorado enacted no abortion regulations during the years of their report, yet the state saw one of the largest drops in reported abortions according to the Colorado Department of Health, from 12,679 in 1990 to 4,215 in 2000. This two-thirds drop in abortions reported by the state is greater than the average drop nationwide in abortion among teenagers of 50% that Dr. New concludes occurred in significant part due to child-killing regulations. How can this be? American Right To Life digs in to show what's happening with the numbers. Dr. New's Heritage Foundation report has been falsified. by emailing and posting online the link to this page: AmericanRTL.org/regs! Tolstoy died in 1910, too early for him to draw an analogy with the subatomic world. "which is pretty much the way laws of prohibition work in human affairs".